Naas CBS have called for “common sense to prevail” in their Hogan Cup semi-final which is fixed for Saturday. 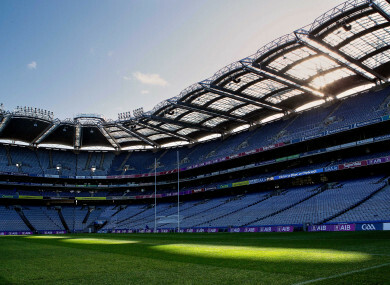 Croke Park hosts the Hogan Cup final on 6 April. NAAS CBS ARE adamant they will not be playing the Hogan Cup semi-final against Pobalscoil Corca Dhuibhne on Saturday. They became the first school from Kildare to string together back-to-back Leinster Post Primary Schools A titles last night, beating Wicklow Schools by 2-12 to 1-9 after extra-time in the decider at Parnell Park. Naas CBS were already into the All-Ireland semi-finals as combined schools cannot advance to the Hogan Cup phase of the competition, but goals from Alex Beirne and Harry Carroll saw the Kildare side retain the Br Bosco Cup in style. Croke Park have fixed the last four clash against the Kerry side for Saturday, giving Naas CBS just two days to recover from a taxing 80-minute provincial final. Their Leinster semi-final against Colaiste Eoin was delayed due to the Stillorgan school’s run to the Leinster A hurling final, which they lost to St Kieran’s College. Naas CBS manager Ronan Joyce said after the game he’s confident “common sense prevails” and the semi-final will be re-fixed for next Wednesday night. “We won’t be playing this Saturday,” said Joyce. “We got confirmation yesterday the match was supposed to be Saturday but Leinster GAA assured us after we facilitated Colaiste Eoin in fixtures that it was going to be next Wednesday and that’s when we’re playing, next Wednesday. “It’s not possible. We’ve played fixtures as they have been all year and we won’t be playing this Saturday. It’s just not possible. I’m hoping common sense prevails but we won’t be playing this Saturday. “We’ve played all the fixtures during the year so we’ve done absolutely nothing wrong,” he continued. They’re the latest team to stand up to the GAA’s fixture makers in recent times. Last summer, Kevin McStay was affirmative in his stance that Roscommon’s provincial SFC final against Galway would be played at Dr Hyde Park, despite the Connacht Council’s initial decision that the venue posed problems on health and safety grounds. Roscommon won their fight to host the final. Then in June came the nuclear ‘Newbridge or Nowhere’ stand-off between Cian O’Neill’s Kildare and the Association. The GAA, after fixing the qualifier tie for Croke Park, eventually bowed to public pressure and allowed Kildare host the game at St Conleth’s Park. Former Waterford boss Derek McGrath admitted earlier this month he “wasn’t forceful enough” in trying secure Walsh Park as the Deise’s home venue for the 2018 Munster SHC. They were forced to travel for the entire round robin series and subsequently bowed out at the provincial stage. But new Waterford manager Paraic Fanning insisted Walsh Park would host their games this summer and the Munster Council later confirmed the venue was fit to cater for their home ties against Clare and Limerick. Last Wednesday week, a farcical situation took place in the All-Ireland Freshers 1 hurling final where the game was not played after UL took umbrage to the late change of venue. Mary Immaculate College was to host the final but Croke Park bosses decided earlier in the week they would to toss for home advantage, which LIT won. UL indicated they would be lining out at the original venue at Mary I, so both sides togged out at different pitches and no match was played. The outcome of the all-Limerick decider is now likely to be decided in the board room. And now Naas CBS are keen to give their players at least a week to prepare for the biggest game of their season. The GAA have yet to officially announce any change in date for the Hogan Cup semi-final, but Joyce remains confident the game will be moved. “We’re playing in the seven-day rule and that’s it,” he stated. The fall-out shouldn’t take away from Naas CBS’s remarkable achievement in winning successive Leinster A titles after only moving up to the grade. It’s unbelievable. To think two years we weren’t even in the A competition and now we’re after winning back-to-back Leinsters. “It just proves the talent that’s in that group and the group last year. I’m just over the moon for them to be honest. They’ve put in savage work. “We made hard work of it but it’s about getting results at the end of the day. You come to finals to get results and I’m just delighted. Delighted for the lads because they put in savage work. Naas CBS conceded 1-1 after the 58th minute as Wicklow Schools forced extra-time last night, but their superior fitness levels told in the extra 20 minutes. “Look in a Leinster final you have to play to the final whistle,” said Joyce. “There’s going to be no inch given towards the end, it was backs to the wall and the ball came back off the crossbar and a goal came off it. “We pulled up a small bit short but a super extra-time to win it and the lads showed the character at the end to get through. Email “'We won't be playing this Saturday' - another team enters stand-off with GAA”. Feedback on “'We won't be playing this Saturday' - another team enters stand-off with GAA”.